It’s Mardi Gras Season! This year, New Orleans Spin Club will be rolling with the KOLOSSOS Art Bike Zoo in the Tucks parade again! If you would like to join us, there’s still time! Come check out one of our weekly rehearsals on the Great Lawn in City Park on Sunday at 2pm or join or Facebook group for all the latest info. See y’all on the parade route! Happy 2019 from NOCGA! We’ll be posting updated events and class schedules soon, so keep an eye out. Spin Club will be meeting on the Great Lawn in City Park bi-weekly to prepare for the Krewe of Boo parade! Join us Sundays at 2pm for Beginning Flag or Thursdays at 10am for Advanced Flag. Check our our "Classes" page for more info. New this fall is our Modern/Contemporary Dance Technique class! Join Jakki at NOLA Spaces on Tuesdays evenings from 5:30-6:30pm. Read all the details on our "Classes" page, and be sure to RSVP on our facebook event! Spin Club will be meeting weekly again after Southern Decadence, so stay tuned for the latest by following our facebook page. New this fall is our Modern/Contemporary Dance Technique class! Join Jakki at NOLA Spaces on Tuesdays evenings from 5:30-6:30pm. Read all the details on our classes page, and be sure to RSVP on our facebook event! We are currently on break for the summer, and will resume classes and reopen our online shop in September. Until then, follow us on Facebook, Instagram: @nocga, and Twitter: @colorguard_arts for fun videos, photos, info on our summer adventures, and the latest on informal spin meet-ups. Join Jakki Kalogridis for this workshop in Modern/Contemporary dance technique in heels! Class will start with a warm up and some basic exercises in center. Learn some tips and tricks to take your floor work to the next level, and we’ll end with some hot new choreography to music. This is not your average Modern/Contemporary Class and it is not your average Heels class! Get ready for a unique fusion of both movement genres that will expand your dance vocabulary. Class can be done with or without heels. If wearing heels, a pair that fits snugly around the ankle is best. Leggings or clothing that covers your legs is recommended for floor work. This workshop is recommended for participants with some prior dance experience. 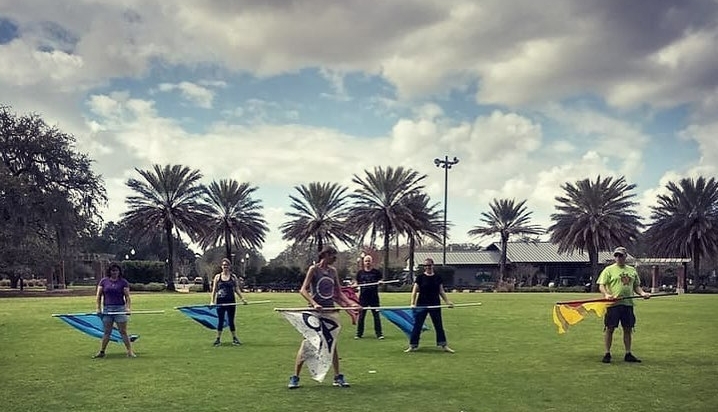 Join members of New Orleans Spin Club as we get together on the Great Lawn in City Park (near City Putt) to spin flags on Flag Day! We'll do a series of warm up exercises before we get into a trick toss or two and then some fun new choreography to music. Flags will be provided, just bring your awesome self! $5 suggested donation for non-members, but no one will be turned away for lack of funds. Your donations help us to maintain our equipment and buy new equipment for member and community use. Ages 12 and up please. Under 18 must be accompanied by an adult. Emergence, a one-night-only collaborative performance event featuring New Orleans Colorguard Arts and Loose Willis, is fast-approaching! Join us at 7pm on Sunday, April 15 at the Marigny Opera House at 725 St Ferdinand St in New Orleans. Be ready for some incredible original music written by Miles Hancock and performed by his powerhouse band. Choreographer Jakki Kalogridis, drawing inspiration from the soundscape, has crafted choreography that explores the inanimate as a potential dance partner. This promises to be a unique event, not to be missed! Community Flag Class is Back! Mardi Gras may be over, but our Community Flag Class is back! Meet us on the Great Lawn in City Park from 12noon-1:30pm on select Mondays. Current scheduled classes on Feb 19, Feb 26, March 12, March 19, March 26, April 2, April 9, April 23, April 30. See our Class page for all the details. $5 suggested donation for all non-members. We'll bring the flags. No experience necessary. All are welcome! There will be no Community Flag Class this week. We are officially on break until after Mardi Gras! We're excited for our 3rd Mardi Gras season! Join the New Orleans Spin Club as they prepare for parades, catch one of our Community Flag Classes, support us along parade routes, or support our educational programs by visiting our online shop! 2017 marked a year of substantial growth for NOCGA! We expanded our classes and met some wonderful new students. Spin Club celebrated its second official year of Mardi Gras parades with the Krewe of KOLOSSOS, performed in the Pride and Southern Decadence parades, performed at Jazz in the Park, and rolled with the Krewe of KOLOSSOS in the Krewe of Boo Halloween parade for the third year in a row. NOCGA produced its very first spring concert featuring performances by New Orleans Spin Club, our instructors, and some of our friends from the Tulane University Colorguard and Green Wave Winds. Congratulations to our 2018 Cast of The Proposition! These performers are already hard at work on new choreography for their upcoming season! Follow NOCGA on Facebook and Instagram to see all the latest behind-the-scenes features, photos, interviews, and more! Classes are Back for Fall! NOCGA is officially on break for the summer. Classes will resume on a new schedule in September. Stay tuned for your favorite classes at new times and locations! More information coming soon! May is here and the Summer season is upon us! We have several classes and events scheduled between now and June, and then we'll be taking a break until late August. New this month is our 4-Week Flag Workshop! Check out our "Classes" page for more details. New Orleans Colorguard Arts is producing our very first show here in New Orleans! We are excited to announce SPIN-ter-DIMENSIONAL, a show highlighting local performers who spin things. Ensembles and solo acts will be featured, including the Tulane University Colorguard, the Green Wave Winds Visual Ensemble, New Orleans Spin Club, and more! The performance is to be held at the Sanctuary Cultural Arts Center at 2525 Burgundy at 6pm on Sunday, April 23rd. Cover is only $8. For all the latest information, and photos of some of our featured performers as we near the performance date, check out the facebook event page here. It's Carnival Season! Here is a detailed schedule from now through Fat Tuesday. Please note the changes to our regular schedule due to parades and festivities. Happy Mardi Gras! Sundays- Flag Spinning (with New Orleans Spin Club) 1-2pm at the Sanctuary Cultural Arts Center (2525 Burgundy)! Read more about Spin Club here. Read all about each of these on our CLASSES page!